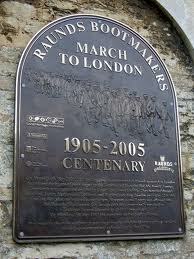 Raunds played a role in the boot and shoe industry until its decline in the 1950s and 60s. Indeed the people of Raunds had been making boots and shoes for the armed services as far back as the American Wars of Independence (1775 – 1783) and up until the 1960’s was the major employer in the town. Early large-scale manufacturers included the likes of William Nicholls and Sons, which spawned other local manufacturers such as Owen Smith, John King Smith and John Horrell, but also the St Crispin Productive Footwear Society and Adams Brothers Limited. In 1904 Adams Brothers Limited employed over 200 workers in their factory on the corner of Spencer Street and Grove Street, and between the wars over 300 people producing mostly service footwear, producing more than two million pairs during the Second World War alone! 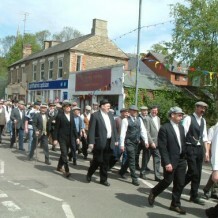 In 1905, a dispute arose about wages to be paid to army bootmakers, which culminated in the Raunds March to London in May that year. By 1939 there were about 20 factories producing footwear. Some specialised in heels, others welts; of the rest, all but one produced Army, Navy or Police footgear; the other made sports footwear. One firm advertised in 1939 to send the Navy, Army, Air Force, Police, farmers and miners footwear to Syria, Italy, West Indies, Spain, France, New Zealand, Canada, malta, Norway, Sweden, Iceland, Faroes, Abyssinia (modern day Ethiopia), Malaya (Malaysia) and Greece. Several factories remained into the early 1990s but all are now closed, with many being demolished and housing estates built. The Coggins Boot Factory was the last to go, and the site of it is now Coggins Close.